WITNESS THE NIGHT, the striking debut by Kishwar Desai, has been nominated for the 2011 Author's Club Best First Novel Award. The Authors' Club awards the most promising first novel of the year, written by a British author and published in the UK with this prize which includes a prize money of £2,500. It will be presented at Waterstone's Piccadilly on 14th April 2011 by this year's guest adjudicator novelist Joanne Harris. Previous winners include Anthony Quinn, Nicola Monaghan and Gilbert Adair. 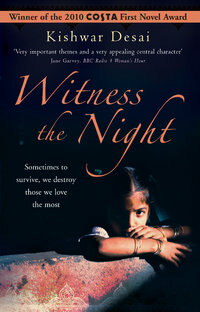 WITNESS THE NIGHT was published by Beautiful Books in the UK in February 2010 and is also published in Finland by LIKE and in India by Harper Collins and in the Hindi language by Full Circle. It has won the Costa Prize for Best First Novel 2010.